Rich media—video, audio, podcasts, and lecture-capture files—is proliferating across university and college campuses and enterprises at a rapid rate. To fulfill the rising demand for media services—for instructional technology, distance learning, library collections, or an educational institution’s public websites—universities, colleges and K-12 schools face the challenge of implementing a sustainable, secure and scalable solution for campus video. The ShareStream Media Platform—a turnkey system for uploading, transcoding, editing, storing, managing and delivering video and audio content in a secure and auditable environment worldwide—is designed specifically to fulfill rising demand from educational institutions for integrating media into online courses and campus communications. 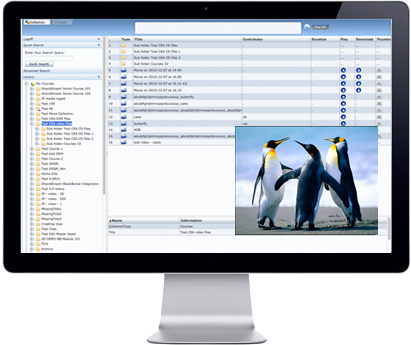 ShareStream also includes Video Extensions for Learning Management Systems, which allow institutions to enhance all of the major LMSs with an intuitive and user-friendly video solution available seamlessly within the LMS environment. 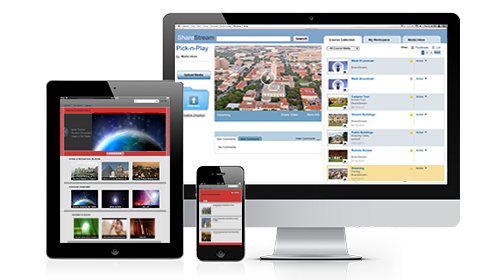 In the age of YouTube™ and iTunes®, faculty, students and other end-users seek an easy-to-use and interactive rich-media experience for their educational institution’s video and audio content. The expectations are growing for instructional media—which has rapidly become a key component of online teaching and learning—as well as for non-course-related video, such as campus news, visiting speakers, virtual campus tours, and sporting events. ShareStream’s MediaManager—the administrative video content management system (CMS) component of the ShareStream Media Platform—allows educational institutions and enterprises to leverage the full power of rich media to educate and communicate, while reducing costs associated with storing, creating, managing, and securely delivering media assets. Implementation of ShareStream’s video management software enables institutions to consolidate multiple, support-intensive “silos” of video and audio content into a scalable and secure institution-wide media system to achieve economies of scale.